Miss Elsie Carlisle, ace woman crooner, has no time for introspection, no time to marry, no time to sleep more than six hours a night, no time, even, to weed out her cupboards which burst with clothes she does not like. 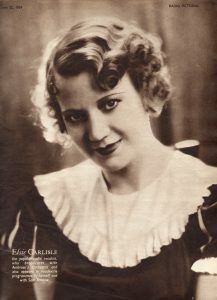 Elsie Carlisle has that “something” in her voice and personality which reaches across the footlights to people of all ages and kinds. She cannot tell you what it is. It was born in her, and has increased with the experience of years. As a tousled, golden-headed child of 12 she faced her first audience in a Manchester theatre. Most women’s resources could not stand this constant usurpation by the public of their private lives. Elsie Carlisle has risen from a sick bed with a temperature of 104 degrees to sing to her faithful public. She is the complete trouper in its finest traditional meaning. Her background is the theatre; her home is its dressing room. “I record at ten; rehearse for a show in the afternoon; give my act at the first house here; rush to the B.B.C. for a twenty-minute broadcast; rush back for my numbers in the second house; go home, take off my stage make-up, change into an ordinary evening gown, and sing at a party which does not begin until after midnight,” she said. Luminous brown eyes gleamed with amusement. “I have three secretaries, two pianists, a chauffeur, a stage manager, a business manager, six times as many frocks as I had before, and two dozen stage costumes. All these have to be paid for.